Unravel the riches and treasures at the heart of the Amazon when you play Fortunes of Amazons with Bitcoin. 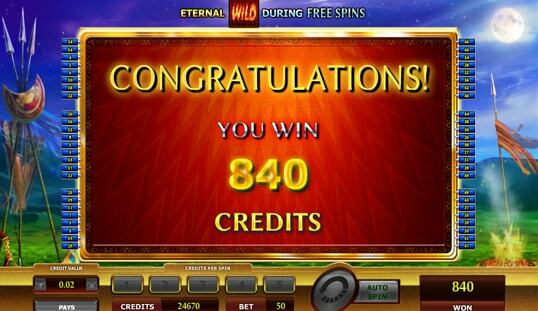 Play the Amaya slot to enjoy the rewards. Fierce female warriors ruled the Amazons, a nation based in Greek mythology and one that is filled with rich fortunes. Fine golden jewelries, shiny armors, and exquisite gems are hidden at its heart, guarded by strong-willed fighters. Battle the lady warriors and seize every opportunity to grab hold of the rewards through the Fortunes of the Amazons slot from Amaya. It boasts high-definition graphics that are pleasing to the eyes. It is also filled with vibrant colors and features smooth animations that succeed in making the game more attractive than the typical online slots. Dramatic music also plays in the background, and is paired with entertaining sounds. Although the music and sounds used in the entire game are not the primary reasons that catch the attention of the players, these elements certainly create a user-friendly environment for Bitcoin players who wish to play slots. 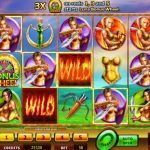 In terms of gameplay, Fortunes of the Amazons slots is just as normal as other online slots. The Fortunes of the Amazons Bitcoin slot is a guaranteed winner among players, mainly because of its 50 playable lines. Having this many lines simply hints the higher chances you can catch winning combinations per spin. Nine regular symbols yield prizes, but it is the three special symbols that make the betting experience more exciting and enjoyable. The Wild symbol takes the form of any regular symbol to complete a line win while the Bonus wheel symbol is the key to win more coins in the Bonus game. Moreover, the Free spins symbol triggers a series of non-stop spins. 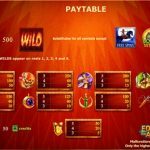 With a competitive pay table, this slot will definitely invite many bettors to play, especially with an easy-to-use interface and simple gameplay that rewards every combination from left to right. 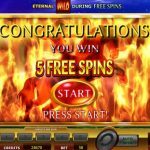 Five free spins on the alternate set of reels will be activated when three Free spins symbols appear on reels 2, 3, and 5 in the main game. 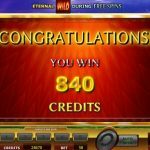 During these spins, expect to receive larger winnings, especially since all Wilds will stay in place for the remainder of the free spins. 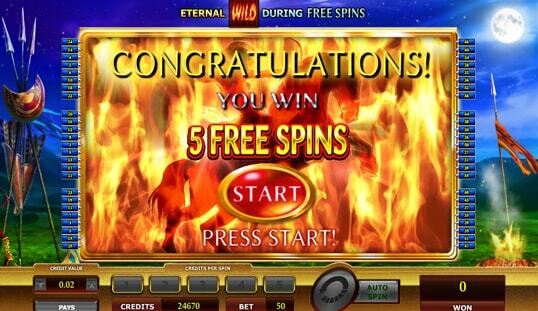 Apart from the Free Spins, you can also try the Amazon’s Fire special. When this mystery feature begins, on the other hand, you will be awarded with a single Free Spin Bonus that features four Wild symbols randomly appearing on any of the five reels. 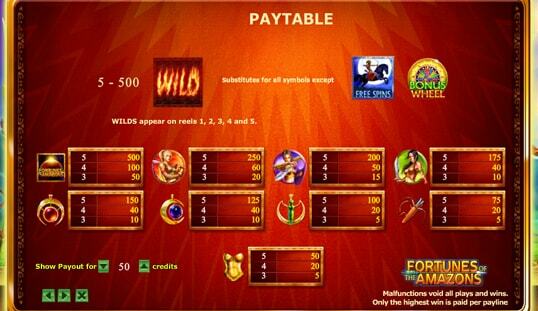 With more Wilds, it is absolutely possible to collect higher payouts in a round. 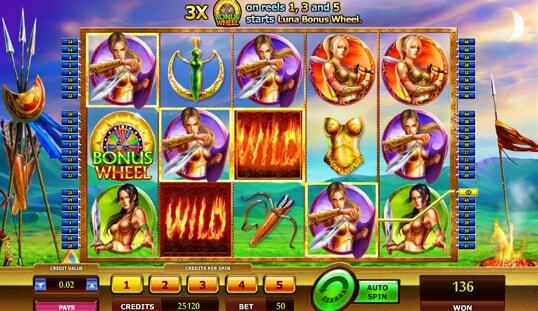 Of course, the bonus game called Luna Bonus Wheel is designed to make Fortunes of Amazons slot even more lucrative. One of the excellent products of Amaya, the Fortunes of Amazons Bitcoin slot is all set to keep you on the edge of your seat. Maximize your winning potential and explore various rewards when you play this game in any of the top casinos online. Maximize the winnings and enjoy the player-friendly environment filled with rewards. Although this Amaya slot is yet to be added to the game libraries of Bitcoin casinos, it is a slot game worth waiting for.